Designed in the style of a 19th-century seaside lodge, the 261-room Ritz-Carlton, Half Moon Bay sits atop scenic bluffs overlooking the rugged Northern California coastline. A bike and jogging trail leads down to the beach 300 yards away, while up on the bluff the hotel's own amenities include two golf courses, a complex of six hard courts, a spa, two fitness centers, two restaurants, and expansive meeting space. The rooms themselves have hardwood floors, stone fireplaces, and broad terraces with views of the ocean, mountains, or golf course. The tennis program is managed by Peter Burwash International's Kevin Harrington. He grew up in Half Moon Bay, where he played junior tennis, left to study geology at the University of Nebraska on a baseball scholarship, and then came home and back to playing tennis when he heard about an opening at the Ritz. He joined PBI in 2005 and has run the program for most of the period since. tennis as He runs programs both for guests and local members. Activities include clinics for all levels, twice weekly doubles mixers, and themed socials that bring guests together with the coastal tennis community. That membership also provides a base for matching guests looking for games with appropriate opponents. The courts lie a five-minute walk from the hotel at a complex know has the Colony Club, which consists of an expansive fitness center, a few guest houses, and those six courts, which are protected from the wind by a berm bordering one of the golf fairways. "The core of my business is the 500+ members," says Harrington. "Then June, July, August bring in tons of vacationers." As a guest, you can look forward to daily clinics, occasional doubles mixers, and studious game matching with members providing a stable of players. As a local, Harrington is more than usually knowledgeable about the diverse attractions of Half Moon Bay itself, not only the beach and surfing, but its historic main street, pumpkin patches (for which it is famous), and the wine tasting and redwood forests in the Santa Cruz Mountains behind. Courts & Fees. Six hard courts, each individually lighted with handsome wooden chairs and low tables at courtside, and a minimalist pro shop, with balls, a few accessories, loaner racquets, and restringing services. Beach. One of Northern California's great surfing beaches is a short walk from the hotel. The Old Course: Originally designed in 1973 by Francis Duane and Arnold Palmer and redesigned in 1999 by Arthur Hills, this parkland course has it's home hole atop the bluff adjacent to the hotel above the crashing waves. Par 72, 7,104 yards. The Ocean Course: Arthur Hills designed this Scottish links style course to have views of the Pacific from every hole. Expect prevailing winds and tight fairways. Par 72, 6,700 yards. Spa & Fitness Center. The 16,000-square-foot spa in the hotel focuses on relaxation, rejuvenation, and salon services. One notable amenity is a candlelit, co-ed Roman mineral bath with a tsunami shower. The hotel's spa adjoins a small fitness center whose equipment is arrayed to provide views of the Pacific. A second larger two-story fitness center adjoins the tennis courts, and has an indoor heated swimming pool, studio with a large number of complimentary classes, and Cardio and freeweight workout rooms with views on the foliage outside. And ... Bike trails lace the resort and continue into the coastal beyond. The region is also known for its bird watching. The Ritz Kids program offers half-day and full-day programs consisting of physical and creative activities for children ages 5 to 12. The options are the rooms and suites in the six-story hotel itself—which have coastal, courtyard, or golf-course views, with fire pits on the terraces of some of the first-floor rooms, and fireplaces in some others— or the Guest Cottages adjacent to the tennis courts. The rooms themselves have hardwood floors, stone fireplaces, and broad terraces with views of the ocean, mountains, or golf course. There are two restaurants: Navio, atop an ocean bluff, where it serves Northern California cuisine; and the more casual Conservatory Lounge, also with floor-to-ceiling windows on the coastalscape. They are complemented by Eno, a wine bar serving a selection of wines by the glass, cheeses, and chocolate. Contact the hotel for rates during the time you wish to visit. Travel Instructions. By Air: The nearest major airport is San Francisco International (SFO), 24 miles to the north. General Tourist Information. For specific information about the immediate area, visit the Experience Half Moon Bay website; for information about the region, visit the Santa Cruz County Conference & Visitors Bureau website. 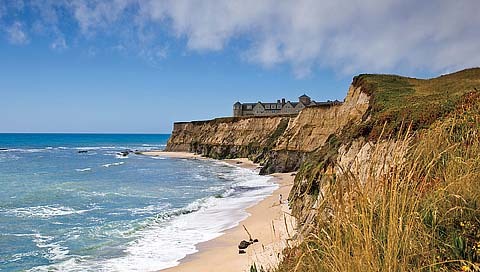 Here's what others have had to say about Ritz-Carlton, Half Moon Bay.